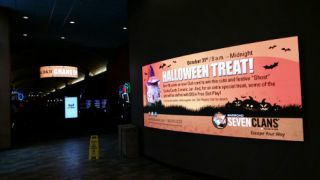 The Seven Clans Casino has opened in Warroad, Minnesota with NanoLumens NanoCurve and NanoWrap LED displays for digital signage that promote deals, contests and upcoming events. Operated by the Red Lake Band of Chippewa Indians, the new Seven Clans Warroad Casino was designed for gambling, entertainment, outdoor activities, and great dining. The complex’s gaming floor features 600 slot machines and 6 gaming tables. The new 60- room hotel on the property overlooks Lake of the Woods and features new amenities, spacious interiors, and casual dining in a 150-seat restaurant. There are even boat docks on site to accommodate visiting fishermen. At the request of Seven Clans, JCM Global, the worldwide leader and most trusted name in currency and transaction management, installed one 5.5’H X 13.5’W 5mm pixel pitch NanoLumens NanoCurve display on a wall in the entrance of the new building and a large cylindrical 6mm pixel pitch NanoWrap display that is 2.25 feet tall and has a circumference of 22 feet. This display hangs directly from the ceiling inside the entrance of the casino. JCM Global also outfitted the casino with top-of-the-line technologies for bill validation and ticket printing to ensure a premium guest experience. The installation includes a 360-degree display that is viewable from every side and a curved wall display to fit the casino’s unique architecture. NanoLumens’ NanoCurve displays are a natural fit for the gaming industry, as evidenced by the displays JCM Global used in its booth at G2E 2013. The ability to place the displays nearly anywhere, including over guests heads in a main atrium, on a curved wall or along the sides of a game room floor, combined with the superior brightness and clarity of NanoLumens’ LED technology, make them eye-catching and exciting for guests.